This tractor-sized sinkhole near Eagle, Wisconsin, opened up the day after the field was harvested. 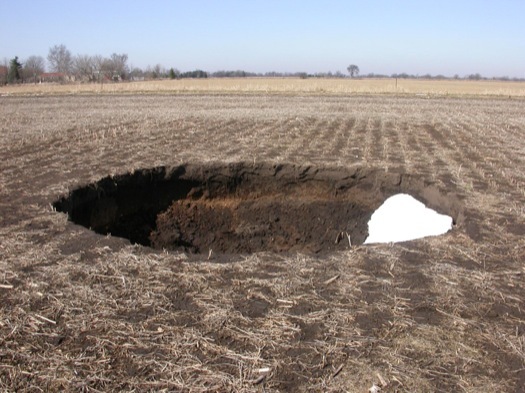 At 5 feet wide and 20 feet deep, this sinkhole is extremely dangerous. It would be impossible to crawl out without assistance. Water dissolving carbonate bedrock created this large opening. 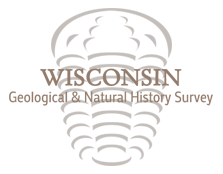 A place where surface or stormwater drainage disappears underground. This picture was taken in Brown County, Wisconsin. 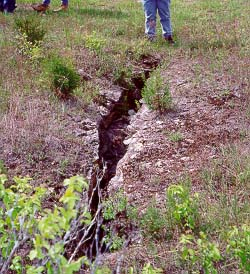 Enlarged fractures appear as large cracks in the ground that become narrower with depth. This enlarged fracture, also called a joint, is from Brown County, Wisconsin. 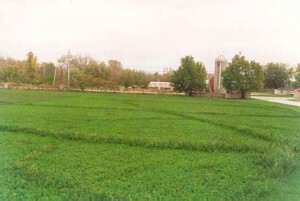 A linear feature on the land surface. Fractures can be a straight stream segment, a line of different vegetation (shown here), or a change in soil color along a line. Picture taken near Bayshore Park in Brown County, Wisconsin. Cave. 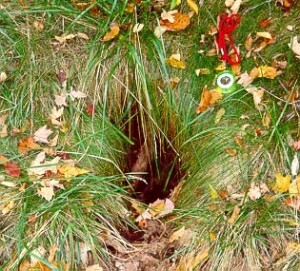 A natural cavity, large enough to be entered, that is connected to subsurface passages in bedrock. Karst fen. Marsh formed by plants overgrowing a karst lake or seepage area. Karst pond. 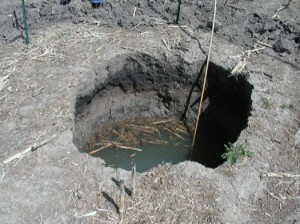 Closed depression in a karst area containing standing water. Mine feature. A man-made shaft, tunnel, cave, hole, or other feature created for mining purposes. 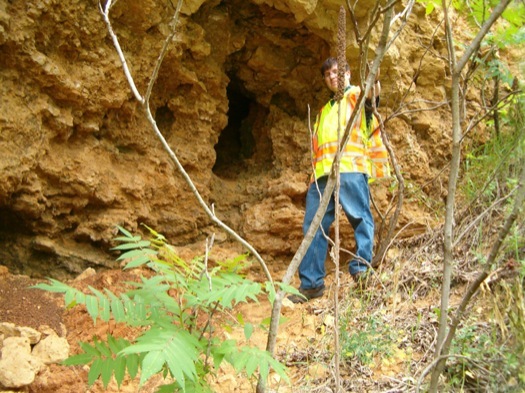 This mine feature is a shaft entrance rock pile in Iowa County. Pavement. Extensive bare areas of exposed bedrock surfaces with many enlarged fractures or sinkhole features. Spring/seep. Intermittent or permanent seepage of water from ground surface or bedrock outcrop or karst area.